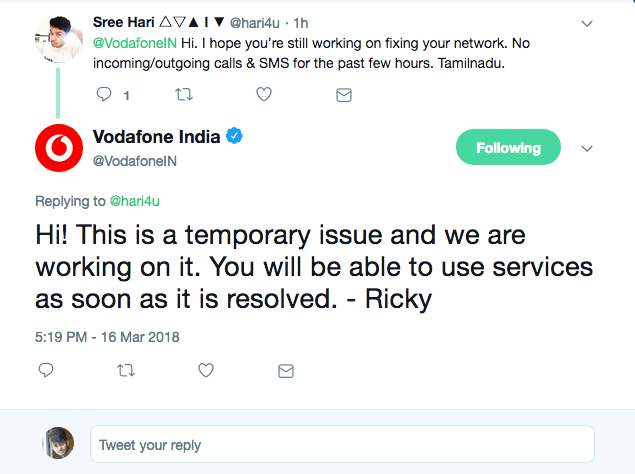 Vodafone customers across the Tamil Nadu state are facing network issues since midnight, and the telco has officially confirmed that there’s a temporary issue going on at their end, which will be solved very soon. Not only in Tamil Nadu, Vodafone users across several parts in Mumbai also reporting ‘Service Not Registered‘ error since yesterday evening. However, the majority of the users are from Chennai of Tamil Nadu state. We have reached out to Vodafone to know what’s the actual issue is, however, the company is yet to respond. Nevertheless, Vodafone services are absolutely fine in Andhra Pradesh & Telangana regions. Voice calls, data and SMS services are working in Hyderabad city as we have personally tested it. As of this writing, there are many customers who’re still facing the issue. Also, we have asked users on Twitter regarding the network outage on Vodafone, and multiple users have commented the details along with the location, while some users are crying about the super-slow 4G speeds on the network. You can find that link here. Vodafone is yet to give an official statement on the network fix. We will update this post once the company pushes out an update. Keep checking this space for more. March 17 update: Vodafone India has issued a statement stating “There was a technical snag that affected certain parts of Tamil Nadu, leading to an intermittent disruption in network connectivity for a short period of time. Our network team managed to resolve the problem and restored normalcy immediately. The Vodafone Kolkata network is also in bad shape. The QOS has deteriorated past few months. Call drops,signal getting eclipsed, mobile data on 3G mode running in 2G. This kind of issues are being faced on corporate connections as well as individual numbers. No action being taken inspite of being highlighted to network team many times. Only sms comes about lit up of new 4G site in your vicinity. Vodafone network is very bad in Bangalore as well. Internet speed are less than 1 mbps most of the time. Call drop issues and some times entire network itself vanishes. After so many complaints and follow ups, they said they need to upgrade the tower but it will take more than 6 months. Im planning to port out from this stupid network.